Lois Elaine Henville was born in Follansbee, West Virginia on September 3, 1942. She was the youngest of five children. She was a devoted believer of the Lord even after losing her husband at a young age. Elaine remarried and lived in California before moving to Colorado in 1992. 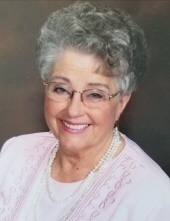 She faithfully served in various areas of ministry including as camp auxiliary president and state chaplain in Gideons, as a Sunday school teacher, in the church choir, and on the prayer team. She also made gifts and crafts that she would give to others to cheer them up. She enjoyed travelling and driving to new places as well as gardening. She was a person whose small acts of service and kindness made a big difference in the lives of others. She passed away on Thursday, April 11, 2019. She is survived by her brother and sister, five children, eleven grandchildren and eleven great grandchildren. In lieu of flowers, the family asks that a donation be made to The Gideons International at www.gideons.org to honor the years Elaine dedicated to spreading the word of God to others. Funeral Service, 10:30AM, Thursday, April 18, 2019, Black Forest Baptist Church, 10915 Black Forest Road, Colorado Springs, Colorado 80908. Interment, immediately following, Evergreen Cemetery, 1005 Hancock Expressway, Colorado Springs, Colorado 80903. To send flowers or a remembrance gift to the family of Lois "Elaine" Henville, please visit our Tribute Store. "Email Address" would like to share the life celebration of Lois "Elaine" Henville. Click on the "link" to go to share a favorite memory or leave a condolence message for the family.